You’ve just posted a witty and insightful comment on the BLOG and you don’t see it. What the heck? First of all, we read every single comment. Your response is valuable to us. Secondly, our BLOG is set up so that we have to approve comments before they are posted. That means somebody has to do it. Sometimes that somebody is unable to do so right away. Sometimes that somebody is on a beach in Florida trying to think of something other than health care in Ontario. Please have patience. Almost all comments eventually get posted. Why do we do this? Aside from questions of libel, we try to keep a lid on the conversation so that it remains a conversation. We originally called our newsletter Dialogue to open up that conversation. When we turned it into a BLOG, we thought it clever to simply insert a “B.” The intent remains the same even though some individuals now feel it sounds more “diabolical.” Maybe we’re that too. People shouting at each other is hardly conducive to a dialogue, although looking through many of the comments — not to mention our own posts — you can still hear quite a bit of anger in the words. We recognize that sometimes that anger is more in the reader than the writer. Sometimes the reverse is also true. Sometimes a good comment has one word that gives us a problem — such as calling someone a defamatory name (ie. those clowns at…). We’re not big on name calling. We’ll usually cut the word and post the rest. Very few comments get deleted in their entirety. Our objective is to host as great a range of expression as is possible. When submitting a comment, please think about the reader. The comments in many on-line news sites do little but shake your confidence in humanity and make you wish you had never snuck a peek. Let’s do a little better for our own on-line community. Any expression of how much you like our BLOG, or a specific post is always welcome. A little encouragement goes a long way. It usually sends us running down the halls in rapture. Similarly, if you have any ideas on how we can make our BLOG better, please let us know too. You can do that using the on-line tools. Finally, we recognize many of our readers are not in a position to divulge their true identities. One of the sad realities in our health system is many people feel they cannot participate without endangering either their career or the care they are receiving. While we do see every e-mail address with each post, we recognize the need for some to use a public pseudonym. That’s okay. If you can use your real name without fear, please do. Meanwhile, your comment will be up soon. Please pass the tanning lotion. 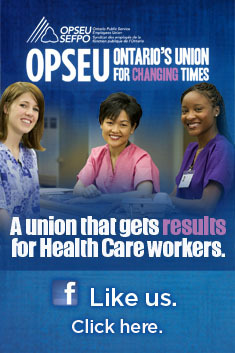 Hello OPSEU Diabloque, just found you guys. I’m an RN at Sunnybrook, and a member of ONA. I also blog about healthcare and business issues. Look forward to reading and commenting. I work in LTC care and the people involved need to give their heads a shake because beds for seniors are being taken up by mental health patients. I’m a psw not trained to work with mental health patients. They DONT BELONG IN A NURSING HOME! A couple of years ago a woman with Alzheimer’s was attacked by a mental health resident, and two psws were hurt trying to defend her. Thanks Ontario government…appreciate the concern you have for seniors and psws….